"So What's Your Favorite of all the Thomas the Tank Engine Characters?" "Favorite Thomas the Train Character?" That's a question children are asked a lot. See how many Thomas & Friends Characters there are to collect and they can all be found here! It's amazing how Thomas train characters are easily recognized by children from all over the world. This website is a growing resource of information and images for children, parents, family and friends wishing to learn to identify all of the Thomas Tank Engine Characters. 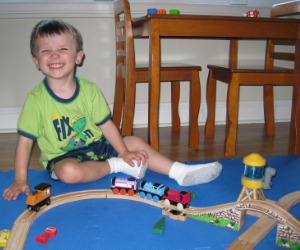 Thomas Train Characters teach children lessons in friendship and playing fairly. Children also benefit from memorizing all of the characters names because they have fun doing it. They also expand their vocabularies and improve pronouncing words while playing with their Thomas & Friends trains and trucks. If you have photos or information on any of the Thomas Train characters that you would like to share, please send them in. The more information and photos the better this site becomes. Photos should be original and creative, please submit character descriptions in your own words. Its ok to submit photos with children playing with their toys. Together this site will grow and become the number one resource for children and families seeking Thomas Train Character Guides. Thomas is a cheeky little engine and tries very hard to be very useful. Percy is the No. 6 on his bunker and is the smallest and youngest of the steam engines. Gordon typically is the first choice for pulling special engines. Henry is based on the on a Stainer 4-6-0 Class 5 engine and he is the No.3 green engine on the Island of Sodor. James is a very useful engine who doesn't like to pull trucks, he prefers to pull coaches. Edward shares a branch line with BoCo, a diesel engine. He is a happy all the time and can be found working on the Quarry line with Henrietta. Emily is modeled after the Stirling 4-2-2 of the Great Northern Railway. Thomas meets the logging locos Bash, Dash and Ferdinand on Misty Island. There's lots of new adventures in this new movie. Thomas train repair a simple guide to repairing Thomas the Train Tomy and Trackmaster trains and cars. Learn how to replace those broken or stretched Hook & Eye Couplings and where to find Thomas train replacement parts. Brave Belle is one of the newest additions to the Search and Rescue Team. She appears in the movie Day of the Diesels, and is available as a stand alone engine LC98127 or Belle to the Rescue Set by Learning Curve. Belle is the only female fire fighter on Sodor! Daisy the diesel wooden engines are retired. She is highly collectible and worth the addition to any Thomas collection and she looks somewhat similar to BoCo from the side. Its a shame they never made the Daisy wooden train in Trackmaster or TOMY battery operated versions. Thomas wooden railway Boco trains are becoming harder to find. These trains are retired and are worth the investment. Boco and Daisy are colored in a similar green color, get both! Day Out With Thomas™ © 2019 Gullane (Thomas) Limited. Thomas & Friends™ Based on The Railway Series by The Reverend W. Awdry. © 2019 Gullane (Thomas) Limited. Thomas the Tank Engine, Thomas & Friends and Day Out With Thomas are trademarks of Gullane (Thomas) Limited. ©2015 Mattel. All Rights Reserved. ® and ™ designate U.S. trademarks of Mattel, except as noted.